Have you ever had the experience of getting your collage papers laid out just the way you want, and then when you have to lift them to apply the glue, you just can’t seem to get them to go back the same way? I hate it when that happens! Casting about for a solution, I came across Jonathan Talbot’s collage method. I highly recommend buying his collage book: Jonathan is a tremendously talented and generous man, and he has packed this small instructional manual with years worth of his own experience. 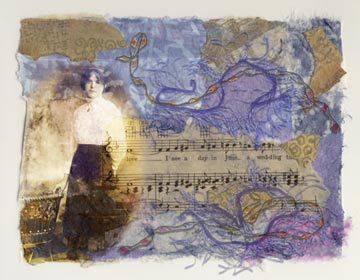 I have borrowed from Jonathan’s method to create this encased collage. It’s also a very handy method to have in your repertoire when you want to deal with delicate, old, or crumbly papers. It seems at first like you are spending forever on the prep work. Well, it takes about the same amount of time as a traditional collage, except that the major time is spent on the front end instead of in the adhering process. Try this method and see if you like it! 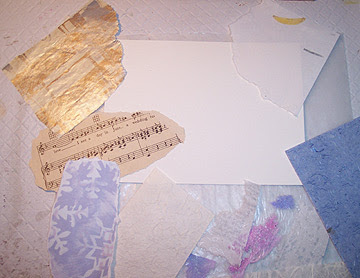 You may never go back to traditional collaging again! 1. 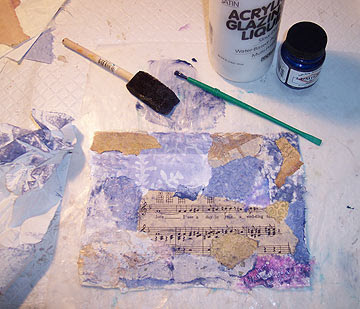 Use thin polymer medium to coat the substrate and each of your papers on both sides. Don’t worry about curling…the papers will flatten out when you coat the second side. I used heavy watercolor paper as a substrate. 2. Arrange. Here’s the good part: they stick to each other and to the substrate, but can be carefully peeled up and rearranged as many times as you wish. 3. Iron, using parchment paper. Here’s the next good part: you don’t have to lift and glue pieces in place, guaranteeing that once you’ve got them placed, they’ll stay there! 4. 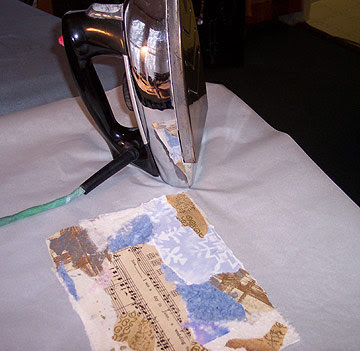 Even now, if you’re not 100% happy with your arrangement, you can iron and peel while the piece is still warm. 5. Add color glazes if desired. 6. Cover the entire piece with matte medium to seal all the pieces in. I used this background collage to create this finished piece, Dreaming of June. 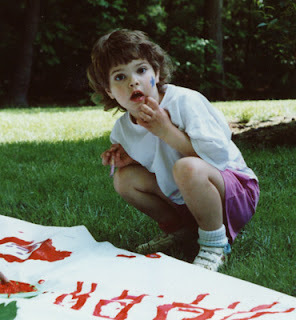 Same for a newspaper on canvas w/acrylic? 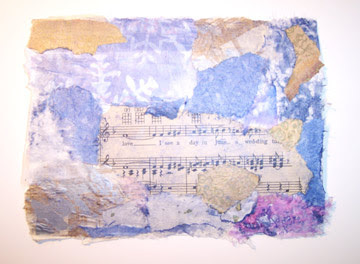 I have used some newspaper in encased collages, but have had limited success. Even encased, it will eventually color. If you like the yellowed look, that's fine, but if not, make a copy of it first and use the copy encased.